When I was a first time mom, I got a lot of advice. I even got advice about people’s advice! Now that I’ve been through three years of motherhood and have just become a new mom again, I suppose I’ve earned my turn to give some advice. Take what speaks to you, and leave the rest, but most importantly, enjoy the journey! Recovery is hard for some moms (myself included!) even if you had an intervention-free birth. Give yourself time to heal…lots of time. Your body will tell you to slow down by increasing the flow of lochia so just listen to your body, and don’t feel pressure to jump back into the flow of life too soon. Breastfeeding is hard for some moms (once again, myself included.) You can do it, but it can feel pretty hopeless at the beginning. Line up support before the birth if you still have time. Have a lactation consultant’s number handy and call some up ahead of time to see if they will make home visits. Some doulas will offer postpartum breastfeeding support, too so be sure to ask that when you are interviewing doulas. It’s important for YOU to take care of the baby. I know your friends and family are dying to get a hold of that baby, but it’s okay to limit that time. It’s best even to limit that time. If family are coming to stay with you, make this clear up front that they are there to help YOU and that means cooking, cleaning, helping with an older sibling, etc. and allowing YOU to care for the baby. Of course they can get some baby snuggles in now and then, but they should not spend the whole visit sitting and holding the baby. When I had family come stay for a week, I ended up actually getting less rest, having more stress and overdoing it. I also only held the baby when she needed to nurse. This time I’ve prepared lists to help show what needs to be done around the house so it will be easy for family to chip in and allow me to be the one to care for baby. You can’t hold your baby too much. It’s not possible. Ignore anyone that suggests otherwise. Your doctor isn’t God. It’s okay to question your doctor. If he/she can’t handle that, time to look for a new one. Really. I’m amazed at the misinformation and outright inaccuracies doctors will tell their patients. (Luckily not mine. He’s awesome.) Locally I’ve heard some crazy things from friends and acquaintances that doctors have stated as fact. Listen to your gut, your heart, your intuition, whatever you want to call it. It’s right 99.9%. And listen to your baby, too. Combine the two and you have a recipe for success! 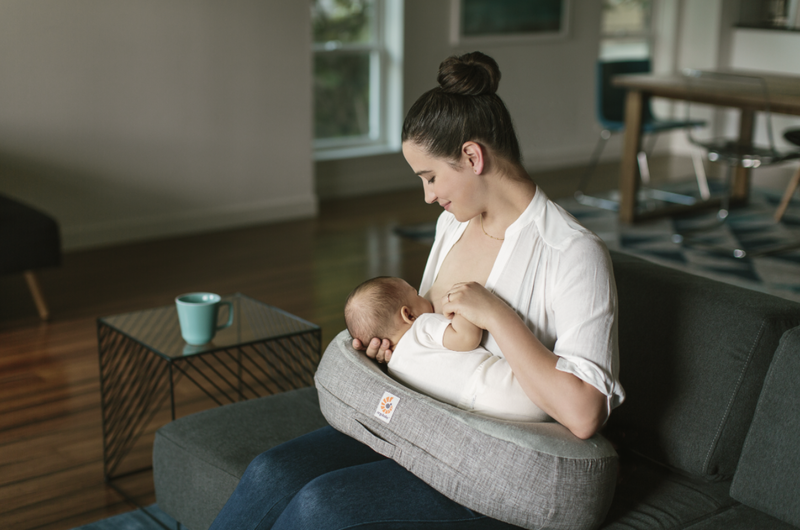 If you have a good carrier, you can do a whole lot of things pretty easily with your baby (and not get stuck carrying around those insanely heavy car seat bucket things or navigating a bulky stroller). You can even nurse in one and no one will even know. Your baby is the best thing in the whole entire world and don’t let anyone convince you any differently. This post originally appeared here on Julia’s blog, A Little Bit of All of It. Julia worked in Advertising and Marketing before her daughter came along but now enjoys staying home with her 3-year-old daughter and newborn son. She blogs at A Little Bit of All of It about those things she is passionate about like cloth diapering, breastfeeding (past infancy), bedsharing/cosleeping, baby-led solids, natural childbirth, attachment parenting, natural living, Christianity and babywearing.